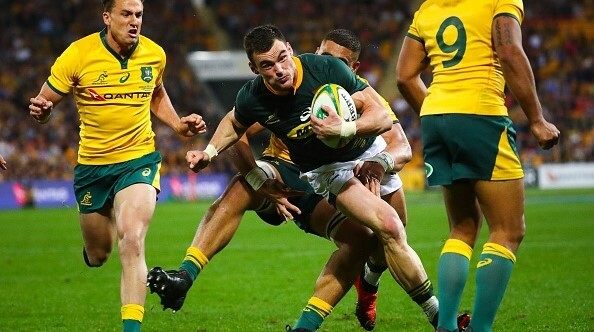 The Springboks could continue to pile the pressure on the All Blacks by claiming a good win over the Wallabies this Saturday, writes CRAIG LEWIS in Port Elizabeth. Six points separate the Boks and first-placed All Blacks on the Rugby Championship standings with two rounds remaining. It’s still difficult to see New Zealand stumbling from pole position at this stage of the competition, but the Boks would dearly love to have a mathematical chance of ensuring that the title remains up for grabs when these two teams meet at Loftus next Saturday. 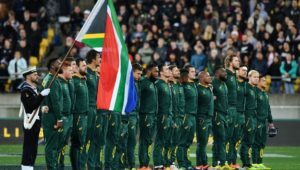 The first task on this path would be for the Boks to claim a bonus-point win over the embattled Wallabies at the Nelson Mandela Bay Stadium, where they have remained undefeated in five previous Tests. 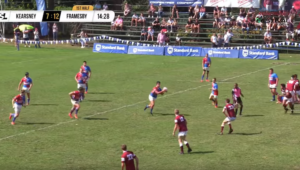 They would then need to hope for a favour from the much-improved Pumas, who host the All Blacks later on Saturday. As it is, the Springboks have already made their presence felt in Port Elizabeth. On Saturday, the Boks turned up to watch the Kings in Pro14 action, while the next evening they joined the Wallabies at a mayoral function in the Friendly City. The team also enjoyed a special braai function on Heritage Day, while taking part in a number of PR engagements on Wednesday as they continued to capture the attention of the PE people, who are set to pack Nelson Mandela Bay Stadium on Saturday. If the Boks’ recent win over the All Blacks demonstrated what they are capable of, then it’s Saturday’s clash against the Wallabies that will provide further insight into the character of a team that is searching for consistency in such performances. It won’t have escaped the Springboks’ attention that they have fallen behind early on in virtually every game this season, and picking up from where they left off against the All Blacks is sure to be the focus for this Saturday. While the Boks’ win in Wellington has helped to ease some pressure, the Wallabies have been batting away criticism from all directions after being humbled at home by Argentina as they plunged to the bottom of the Rugby Championship standings. This is an opportunity for the Springboks to strike when their confidence is at an all-time high, while demonstrating the killer instinct that is synonymous with the leading teams in world sport. It is a rather damning indictment that the Boks have managed just one win from their last six games against Australia, but it’s not since 2011 that the Wallabies have mustered a victory in South Africa. The Springboks should look to their set pieces and much-improved maul to establish ascendancy against the Wallabies, but they will need to be wary of omnipresent flanker David Pocock, who missed the meeting between the two teams in Brisbane due to injury. 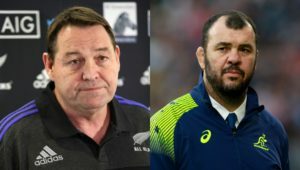 Understandably, the Boks have made minimal unenforced changes for this clash, and it points to their desire to maintain the morale-boosting momentum that they found in New Zealand. A good win for the Springboks would solidify their place in second spot on the Rugby Championship table, and allow them to continue riding a wave of confidence as they head into the highly-anticipated rematch against the All Blacks. o The Springboks have won just one of their last six games against Australia (drawn two, lost three), despite leading at half-time on four occasions. o South Africa are undefeated in five consecutive games at home against Australia (won four, drawn one) and have kept the Wallabies to 10 points or fewer in all these games except the most recent encounter (27-27). o South Africa are undefeated in five games at Nelson Mandela Bay Stadium (won four, drawn one) and have never conceded more than 15 points in a match at that venue. o Australia have lost their last three games on the road; a loss this weekend will equal their longest losing streak in away matches since 2008-09, when they lost four games against Wales, New Zealand (twice) and South Africa. o South Africa will be out to win back-to-back games against two different opponents in the Rugby Championship for the first time since 2014, after downing New Zealand 36-34 in the previous round. 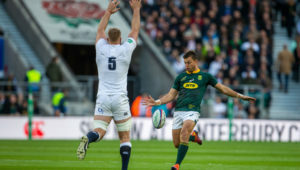 o South Africa have a goal kicking rate of just 57% in this edition of the Rugby Championship, the worst rate of any side, missing an average of 2.3 kicks per game. o The Springboks (eight) have averaged the most turnovers won per game so far in this tournament, winning nine against the All Blacks in the last round. Australia (six) have averaged the fewest turnover wins per match, with just five in the last round. o South Africa’s Pieter-Steph du Toit (61) has made the most tackles in this tournament, including 24 in round four against New Zealand, which was a career-best tally for him in a Springbok jersey. He also leads his team for carries (39). Springboks – 15 Willie le Roux, 14 Cheslin Kolbe, 13 Jesse Kriel, 12 André Esterhuizen, 11 Aphiwe Dyantyi, 10 Handré Pollard, 9 Faf de Klerk, 8 Sikhumbuzo Notshe, 7 Pieter-Steph du Toit, 6 Siya Kolisi (c), 5 Franco Mostert, 4 Eben Etzebeth, 3 Frans Malherbe, 2 Malcolm Marx, 1 Beast Mtawarira. Subs: 16 Bongi Mbonambi, 17 Stephen Kitshoff, 18 Wilco Louw, 19 RG Snyman, 20 Marco van Staden, 21 Embrose Papier, 22 Elton Jantjies, 23 Damian Willemse. Wallabies – 15 Dane Haylett-Petty, 14 Israel Folau, 13 Reece Hodge, 12 Matt Toomua, 11 Marika Koroibete, 10 Kurtley Beale, 9 Will Genia, 8 David Pocock, 7 Michael Hooper, 6 Ned Hanigan, 5 Izack Rodda, 4 Adam Coleman, 3 Taniela Tupou, 2 Tatafu Polota-Nau, 1 Scott Sio. Subs: 16 Folau Faingaa, 17 Sekope Kepu, 18 Allan Alaalatoa, 19 Rory Arnold, 20 Rob Simmons, 21 Nick Phipps, 22 Bernard Foley, 23 Jack Maddocks.